After three years of daily use, I've decided to give up my Apple Watch for a week to prove to myself how useful and important it really is -- or maybe, it isn't. Before I ditched the watch for a week, there were a few things I wanted to sort out. What did I use my watch for most, and what -- if anything -- would be the replacement. I considered a lot of options for my possible Apple Watch replacement, and I came to the conclusion that I couldn't ditch a wearable completely. I still needed something -- however minimal -- to help with at least a couple of my frequent tasks. That's why when I shed my Apple Watch, I went with a super cheap fitness tracker that I had reviewed in the past -- the Mi Band 2. It has a surprisingly large number of features and I was able to pick it up for less than $30 bucks. “I have a bad history of not paying attention to my phone, and my Apple Watch notifications help make sure I don't miss anything. So, that's high on the list. - Like you when I’m home I don’t pay attention to my phone. I used to miss calls every day. - I had no idea how many steps I took per day. - I have a heart condition and getting a heart rate used to be inconvenient. * With an Apple Watch all of those problems are solved. Very importantly, now I never miss a call, voice mail or text. - Added to that, on the AW I check the weather, use the breathing app as well as timers/alarms and Find My iPhone, look at my heart rate and my calendar without dragging my phone with me while I’m moving around the house. - If my SS Apple Watch Series 2 ever dies, I’ll get another AW. Dragging the phone around is indeed a drag. I have had an apple watch since the first version and I am delighted with how the device has come along. The apple watch 3 has relegated my $17,000 Cartier Panther and several other expensive watches to the jewelry box. I will be right there when preorders start for the AW4. The nice side benefit is that when you go to sell one, the price holds up nicely. To reiterate my feelings from over 3 years ago: It's unnecessary, yet indispensable. It's a funny product. It doesn't seem to have the momentum or mindshare of the iPhone and iPad in terms of revolutionizing the market, and yet it quickly dominated not just smartwatches, but put a hurt on fitness trackers and traditional watch sales. In the first year I think Cook said it was #2 behind Rolex and then last(?) year said that they were number one in revenue across any watch maker. Maybe the iPhone and iPad took the lead positions in their comparable market categories faster, but we're still talking about a massive product success no matter how you cut it. Another funny aspect is the longevity of this relatively slow digital device. If not for cellular coming this past year (which in itself is an amazing feat for this for the size of this device) I would probably still be ricking my original (Series 0) Watch from April 2015 with plans to get the Series 4 this month for the new OS features. 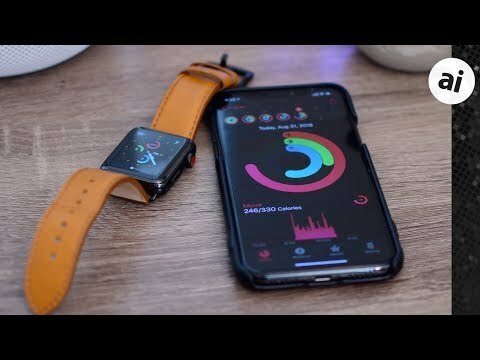 I was using watchOS 4 betas with my Series 0 a year ago without issues. I'd even say that it was more responsive than when I first bought it (something that I think came with watchOS 3(? ), which is in itself funny because they either got a lot smarter or did something dumb with the earlier OS builds. I've never seen such a dramatic YoY performance improvement in CE). Personally, I think Apple does itself a disservice by announcing and then releasing so much stuff around the same time because I'm very likely to get the Series 4 Watch and keep my iPhone 7 Plus for a third year. I'm also hoping that we see SiriusXM (and Spotify) apps launch when watchOS 5 officially launches since they've opened up streaming services that no longer require them to be tethered to the iPhone. If this happens then I'll be even less likely to get a new iPhone this year. However, if they staggered the different product categories to different parts of the year I'd probably buy each every year. But that's me; I'm sure Apple has analyzed this and because of how closely their OSes are now tied together they feel it's best for them financially to announce and launch them all at the same time. I've worn one of my Apple Watches almost every day for three years. I've gone maybe seven to ten days, all on different day, because I either forgot to put it on, or wanted to wear one of me really nice analogs. Once I left the house, I was constantly reminded that I didn't have my Watch. My phone doesn't have a Taptic engine, so if I heard a notification, I looked at my bare wrist or analog, then impatiently dug out my phone. Or, if I got the phone out to make a call or plug in a destination in Maps, or for any reason, I'd see texts and missed calls. With the Watch, I keep the phone ringer off, and don't use vibrate. Full disclosure and in all honesty, etc., I would never plan to go any time without it. I'm a watch and Watch guy. I've chosen and/or needed to wear a watch since I was a kid, and love watches. So not wearing a watch just isn't a plan. Apple Watches, except my SS, are significantly lighter than my analogs, so I occasionally forget that I'm not wearing one. I take them off to charge, shower, or do work that would bang them up. I've done the same for 99% of the watches I own/owned. Work watches didn't get that luxury. I'll be getting an S4, to be sure. I keep telling myself I'll wear a watch and Watch on each wrist, just to take my analogs out for some air. They're too nice to keep in a drawer. When Apple makes a round addition with some elegant faces, my analogs may never get out. Excellent! Novel exercise to go w/o it for a week. Enjoyed the review. Well done. I'm still using a Series 0...mainly for running. I wear it everyday, all day long. I do like seeing the temp and time throughout the day. If I can run, on average, every other day, i.e., 15+ plus runs a month, everything else seems to take care of itself. My runs get more frequent, longer with lower times w/o really stressing about it. My AppleWatch got me to focus on my heart rate when I run. To avoid injury, decrease recovery time, improve times, you have to 'run slower to run fast!' The AppleWatch allowed me to achieve this in realtime! P.S. I do like the minimalist form factor of the Mi Band. The brown leather one? Nuts. Leather bands are handsome. Andrew, I just completed the same test. I've had an Apple Watch from the beginning, eventually upgrading to the Series 2 in Jan. 2017 and now, I am thinking about upgrading to the Series 4. But, before I give Apple another $400, I decided to place my Apple Watch in a drawer for 2 weeks and go back to my Citizen Eco Drive watch. I love the Citizen watch and I've missed it for the last few years but it's only function is time/date. I am currently on Day #8 of my test and this morning, I decided to go back to my Apple Watch. I knew that I used it a lot for Apple Pay, playback control, timers, notifications and such, but I forgot about how useful it was for unlocking my Macs and checking stocks and weather. I also missed a meeting at work last week because I left my phone in my office and I was talking to colleagues. I have become reliant on the watch notifying me of upcoming events. I also realized that I was reaching for my phone so much more that I was before. This morning I finally switched back to my Series 2 and I'll be ordering the Series 4 when it comes out. For sleep, try AutoSleep which works great and has a companion HeartWatch. I use both, though AutoSleep is the one I use most often. Personally, I think Apple does itself a disservice by announcing and then releasing so much stuff around the same time because I'm very likely to get the Series 4 Watch and keep my iPhone 7 Plus for a third year. lok on on the bright side. After buying the watch now, by the time you can afford a new iPhone you might as well wait for the next version. Very nice article. I love my Apple Watch and I only have the Series 0, which kind of makes it sound like a prototype. The only thing I miss is sleep tracking. I wish Apple would do something to fill this gap, perhaps a super lightweight "sleep companion" band that is only worn at night for sleep data acquisition and docked during the day in the same dock that charges the Apple Watch at night. I had a Jawbone fitness band years ago and the sleep tracking software feature was actually quite well done. The Jawbone band itself was probably the worst piece of junk hardware ever built for sale. It literally disintegrated and I was horrified by the quality of the components and shoddy construction of the thing. Pound for pound the Apple Watch is an amazing value compared to some of the fitness bands of the same generation as the Apple Watch Series 0. Some of those companies truly deserved to go out of business. Paying 2X or 3X the cost of a fitness band while getting 10X better quality and 100X better customer support makes the Apple Watch an amazing value for an amazing little device. I will be getting a new Apple Watch and a new iPhone this year. I also suspect that the next generation of AirPods will have some secret sauce (health related) that makes them perform some new magic tricks when paired with the next generation Apple Watch and iPhones. All of these separate and seemingly independent devices will someday, very soon I hope, operate together as a single integrated system to provide a broader range of personalized awareness, health, and well being services for their owners. Love my AW3 and wear it everyday all day. To Andrew: You realize that by not wearing your AW for a week means you’re going to miss out on some achievements, right? That would drive me nuts. I used to think badges/medals were kinda silly, but now it bothers me if I don’t hit a goal. I was under the weather last month and facing the possibility of missing my goals for one day and breaking my one year streak. This motivated me to keep active during the day (instead of just lying in bed). Though it took longer than usual (11:00pm instead of my usual 5:00ish) I still managed to hit my goals. Edited: My AW3 works great, but damn, that AW4 looks fantastic. for my case i don’t think it will take me a week to figure out how important apple watch is to me. just yesterday, i was driving about a mile away from home when i realized i forgot to wear it. the route back was longer and complicated and had bad traffic, but guess what? i turned back anyway! that’s how important to is to me. i love my apple watch! This article looks like a nice Sponsored Ad for the Apple Watch. It's really hard for me to believe that you're actually using all the functions mentioned in the post and that you need them so badly . Interesting read about addiction. I still have my series 0 and use it now and again but then again a couple of weeks back I also started to leave my phone and other devices at home. Its suprisingly weird the first couple of times to be device free which in my mind is indicative of a problem. So now I try to go out device free as much as possible. Its very liberating and I find my attention improving. Outside of work I can do without devices although I think i would always carry if visiting another country. Interesting. My watch has weened me off my phone. The only thing I see in terms of notifications is text messages from my household. Leaving the house for errands and knowing my family can reach me but not having the urge to check every crazy way people could contact me (email, social media, et cetera) is pretty freeing. I also believe in practicing digital blackout days.